1. Hell is a horrible place. | The Scriptures are loaded with statements regarding the horror of Hell. Whether these are figurative or literal depends on one’s interpretation but all these statements should be taken seriously. 1. Heaven is an exhilarating place. | According to 1 Corinthians 2:9-10 — “But, as it is written, ‘What no eye has seen, nor ear heard, nor the heart of man imagined, what God has prepared for those who love him’ these things God has revealed to us through the Spirit. For the Spirit searches everything, even the depths of God.” Many of us grew up thinking heaven was going to be clouds, harps and boring, but according to Scripture, we were extremely misled! Heaven will be incredible! 2. Heaven is a holy place. | Heaven is holy because God is holy and He’s there. 3. Heaven is an exclusive place. | Heaven will be that place with no more sickness, pain, sorry, death or problems and Jesus said there’s only one-way to get there — through Him. “I am the Way, the Truth and the Life, no one comes to the Father except through me.” (John 14:6) As a Believer in Christ, I want to take as many people with me as possible! 1. Do you believe Heaven and Hell are real places? (According to a Pew Poll, 72% of Americans believe in Heaven, but only 58% of Americans believe in Hell.) What Scripture passages (evidence) do you have that backs up your belief? 2. If Hell wasn’t a real place and there was only Heaven, would that effect God’s character? What does the doctrine of Hell and Heaven tell us about God? Why does that matter? The Bookshelf I If you go to any bookshelf with historical texts, you can be confident that the New Testament has earlier copies, smaller time gaps between copies, and a larger number of copies than any other book written. The Masoretes I In 600 AD, you could find a room full of men who had given their lives to one task — the careful transmission of the text of the word of God. These men exercised extreme care to ensure accuracy in the transmission of the word of God. We can have confidence that we have been given a gift in the Word of God and that it is worth building our lives on! • How does the reliability of scripture further solidify your confidence in the Gospel? • Is there someone in your life that needs to hear about the reliability of the Bible? How can you start praying for the Lord to open doors for those conversations to take place? Have you ever wondered how you can hear from God? Ever felt like it’s some great mystery that is only solved by the super-spiritual Christians? Or has it just been a while since you heard anything from Him? You’re wondering where he might be or if you’ve done something wrong and He won’t talk to you? 1. Desire | God speaks to his children when there is genuine, wholehearted desire to hear from him. 2. Dedication | To hear God speak you must obey what He has already said. Why would we think God would speak to us and give us new direction and insight when we have been unwilling to obey what He has already told us? 3. Discernment | Here are several key ways to develop a discerning heart. Remember you cannot develop discernment apart from the Bible. • Discuss God’s Word with other believers. As a family select 1-2 things you want to focus on over the coming week to begin hearing more from God. Is there a sin you need to confess and get help in overcoming? Is there a discipline you need to develop regarding the Bible? Do you simply need to spend time praying to seek God wholeheartedly? The power of sitting and meditating on scripture is something that is often overlooked in the busy world that we live in. Sometimes what scares people away is that they don’t know where to start or how to approach passages at all. Daniel 9 gives an amazing example of how to read scripture prayerfully and allow it to consistently change our lives on a daily basis. The Bible is full of God’s promises to us, but in order to know them we have to read them! While reading the book of Jeremiah, Daniel read the passage in which God prophesied the end of the exile, the time of judgment they were currently experiencing. After Daniel read this he longed for God’s Promises to come true. Daniel didn’t stop there. He wasn’t just eager to see the word of God fulfilled. His longing led him to seek the Lord. He didn’t read Scripture as an end unto itself. He read Scripture to know about the God who was revealed in it — who was speaking through it. 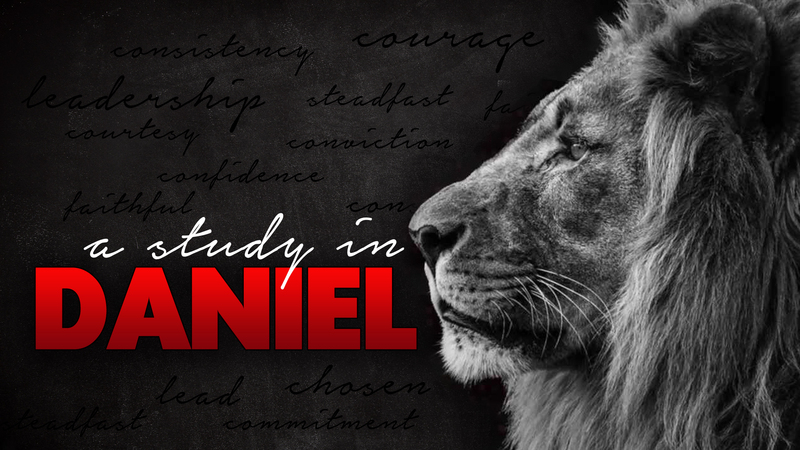 Daniel sought the Lord eagerly, but he also sought God humbly. He came to God acknowledging his own failures and the failures of his people. Daniel read, Daniel longed, Daniel sought — and God showed up. It seems weird to say. But honestly, for some reason, we don’t always expect God to show up. We pray prayers that give God an out. We live our lives not factoring in the presence and activity of God. Daniel prayed and God showed up. Hebrews 1 declares that God spoke “in many portions and in many ways” — which means, God shows up in unexpected ways. • What commitment will you make to read God’s Word daily? • What role does God’s Word play in helping you develop a greater intimacy with Him? Throughout this chapter in Daniel, we see how Satan works and the lies that he tries to tell us. The enemy often tempts us with seemingly enticing gifts of position, possessions, and passions but, in reality, these temptations are only disguised as gold and carry no eternal significance. Yet, because we have been given Satan’s playbook, this also means we know how to overcome his schemes. 1. Scripture always uncovers the lies. Scripture is God-breathed and is useful in every situation, especially when it comes to combating the enemy. The Bible illustrates how Jesus’s followers sought His Word in times of trial. The enemy has no hope in prevailing against the Word of God. 2. The way to overcome Satan is to be fulfilled. We as believers are invited to experience true fulfillment in Christ Jesus. Once we have experienced this, we are filled with the power to overcome any and all of the temptations Satan could ever throw at us. Trying to fill ourselves with anything less than Jesus will always leave us wanting more. With God, however, we have all that we will ever need. The enemy tempts us through position, possessions, and passions. • What are some ways that Satan tempts you in these areas? • What are some passages of scripture that would be useful to hide in your heart in order to overcome these temptations? We all have the desire to live a life of impact–make a difference with our lives. The boldness of Shadrach, Meshach, and Abednego show us an incredible example of what impacting culture for the glory of God can look like. From their example, we can see that influence is determined by two factors. 1. Who you’re willing to worship. Worship can show up in subtle ways. In our day, it’s rarely a large golden idol, but we worship anything that captures our full affection and takes the place of God. 2. What it takes to make you quit. Commitment is not about earning God’s blessing. It’s about responding to God’s blessing. You don’t commit your life to Christ to get anything. You commit your life to Christ because you have everything. The bold decision Shadrach, Meshach, and Abednego made to honor God still resulted in being thrown into the fiery furnace, but God protected them and stood right beside them. What a beautiful reminder that as we encounter trials in our own life, Jesus has already proven that He will be right by our side. What are some things in your life that are in danger of becoming idols by taking the priority and focus away from God? Describe a time when you were put in a situation to have to choose between honoring God or going with the crowd. What does it mean to you to know that God is faithful to stand beside us as we go through the fiery trials of life? Just a reminder that tomorrow, at 3:00pm Monday afternoon local time, a moment of remembrance will take place for those who served and gave their life for our country. All Americans are asked to pause for one minute of reflection, gratitude, and unity. An attitude of Submission | You cannot be over those who are under you until you are willing to be under those who are over you. It doesn’t matter how above everyone else you think you are, if you let your pride get you out from under authority, you’re going to get in trouble. The Christian leader is always listening and always learning. We never forsake the timeless truths of Scripture, but are always ready to give an intelligent answer to the questions of the day and point people to Jesus. • Who was/is the most courageous person you’ve ever met? • What made him or her courageous? • Did this person display any of the attitudes we heard about today? • Which attitude is the most difficult for you to have? • What makes that attitude difficult for you? • How are you – or how are we as a family – making an impact in the world? Finally, take some time as a family. Ask God to show you and/or your family how and where you can make a bigger impact in the world today for Christ.